Cowell's Beach in Santa Cruz, CA has risen to the top of Heal the Bay's Beach Bummer list this year after hovering near the top for 5 years running. 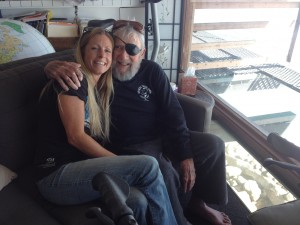 In their efforts to build community awareness of the pollution problems at this beach and to help generate the political will to do something about it, the Santa Cruz Chapter's Education Coordinator Amber Jones recently sat down with local surf industry legend Jack O'Neill to discuss the issues at Cowell's. Read more about this conversation on the chapter's website. The Chapter has been documenting the water quality impairments at Cowell's Beach for years now through their weekly Blue Water Task Force water testing program. They are also conducting a comprehensive watershed study of the San Lorenzo River that discharges into the ocean in downtown Santa Cruz in collaboration with the Coastal Watershed Council, the County and City of Santa Cruz, and the Regional Water Quality Control Board. The aim of this study is to locate bacteria hot spots and identify their sources so management agencies can focus remediation strategies to clean up this watershed and ultimately see real water quality improvements at Cowell Beach. See where the Chapter is testing and view their data on the BWTF website or check out the BWTF Facebook page. The good news is that Chapter Blue Water Task Force Coordinator Sam Blakesley recently convinced the City of Santa Cruz to form a working group to come up with solutions to fix the sources of pollution at Cowell's. The Chapter will join the City and other local environmental NGOs on this working group. Hopefully this new working group will result in some real improvements at the beach. The Chapter intends to continue to push for action until Cowell's is off the Beach Bummer list for good.